I found a middle-class guy who insists Obama raised his taxes, and an ex-banker telling people the problem isn't Obama, it's the banks. Plus: Used tea bags are ugly. 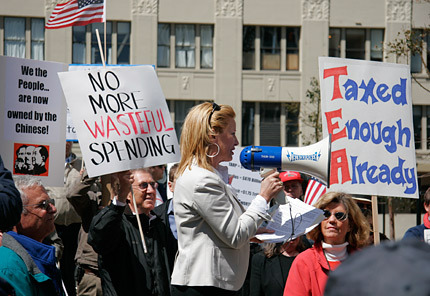 Melanie Morgan speaks at the San Francisco Tax Day tea party. I tried to keep an open mind as I headed over to San Francisco's Civic Center Plaza for our local Tax Day tea party, where a crowd of about 250 people protested, well, a whole lot of things having to do with Barack Obama. I knew I'd have a lot of chances to reinforce my stereotypes; I tried to look for things I didn't expect to find. First, the stereotypes: A little man in a Michael Savage cap carrying an "Obama = Imposter" sign handed out fliers demanding that Speaker Nancy Pelosi begin impeachment proceedings because Obama "is not a natural-born citizen." There were several hammers and sickles; lots of signs warning against socialism and communism; three Betsy Rosses; a guy in what seemed to be a coonskin cap carrying a big sign with a gun that read "Reload for the Revolution" (to be fair, when he got onstage, he backed "reloading with ideas," urged everyone to vote, and said nothing about guns -- and later, Rolling Stone's Tim Dickenson identified him as local author/man about town Barnaby Conrad III). One woman wore a white baseball cap adorned with dozens of used tea bags, which looked surprisingly ... icky. Almost nobody was actually from San Francisco; I heard Moraga, Tiburon, Ross, Marin, Daly City. Oh, and the crowd was almost exclusively white. But I had a few surprises. Right off the bat I did what I promised to in my Tuesday post: I asked a protester if Obama raised, or lowered, his taxes, trying to start a dialogue. I found the perfect person: Brad Huffman carried a makeshift brown cardboard sign that read (I paraphrase): "I can't afford a better sign because Obama raised my taxes." Did Obama really raise your taxes, I asked Huffman -- and he answered yes. Surprised, I asked Huffman what he did for a living, and he told me he works in the "private security business" and makes roughly $50,000 a year. "Obama lowered your taxes," I told him. But Huffman insisted I was wrong; he's getting $28 less every pay period since Obama took office, and he hadn't changed his salary or deductions. I was stumped; so much for my effort to have an enlightening dialogue about how Obama's tax plan actually cut taxes for, I'd estimate, 99 percent of the people at the tea party. I find the one guy making $50,000 whose taxes went up, or at least, so he believes? The day went on like that for a while. I met a lovely man who gave me a small copy of the Constitution and told me the credit crisis began when we passed the Community Reinvestment Act under President Carter, and Democrats forced banks to lend to people who can't afford houses. I told him that, actually, home loans covered by the CRA had a lower default rate than other loans, and he thanked me for sharing that information, and promised he'd look it up when he got back to his computer. Dialogue achieved! I moved along. Nationally the tea parties have been supported by Fox News; locally they were endorsed by right-wing talk radio station KSFO, home of Rush Limbaugh, Sean Hannity and Dr. Laura. KSFO printed up hundreds of tea party signs, and former host Melanie Morgan, who now runs the pro-war Move America Forward group, was the only remotely recognizable figure attached to the event. Morgan led the group in a two-block march to House Speaker Nancy Pelosi's office, though Pelosi was reportedly at a book signing, not in her office. I have to say, the group had an admirable, open-mike approach to who spoke at the rally; it looked as if anyone who went up and asked to got to speak. Unfortunately for a reporter, the megaphone was terrible, and almost nobody was introduced with his or her full name. So I can tell you there was a blond-dreadlocked libertarian worried about a "police state," a Polish immigrant in a Ron Paul hat warning against "socialism," a lovely Ayn Rand devotee from the Ayn Rand Center, along with Morgan and "Reload" man and an all-white roster of people worried about what Obama's doing with their taxes. Finally, Morgan introduced Shawn Steel, whom she described as a leader of the 2003 recall movement that toppled Gray Davis and made Arnold Schwarzenegger California's governor -- a real lesson in "be careful what you wish for," because honestly, the tax-hiking Republican got louder boos than Obama did. Steel insisted the tea party movement wasn't a product of either party, praised the high turnout of Ron Paul supporters (who brought the average age down by about 10 years but tipped the male-female ratio hard in the male direction) and urged the group to continue to have "fun." Being an optimist, I saw a few places where smart liberals might be able to win over some of the protesters. One of the speakers, who looked to me like a closet liberal, I know the type, got a big hand when she came out for a boycott of Chase Bank. Several people and signs railed against TARP and the bailout of failed banks and AIG. But former banker Christina Plutarkos, in a black suit and gray pumps, had me beat for optimism, hands down. I watched her confess to a small crowd that "I don't oppose Obama," while she tried to convince them the real economic scandal is the bipartisan bank bailout. Plutarkos carried a big yellow sign that on one side read, "The stimulus is already working saving essential jobs ... it's the bailout that's the problem," and on the other asked: "Why did Treasury let AIG close out credit default swaps for 100 cents on the dollar?" I'm not kidding. She was trying to get the tea partiers to turn their anger toward the bailout, and she was getting a fairly respectful hearing. "Liberals are idiots, they don't try to engage these people, they're too ideological," Plutarkos told me. How was engagement going? "It's been very interesting. People are nice to me. A burly 60-year-old man gave me a hug. 'I'm with you, honey.'" She made friends with a group of young libertarian guys, and walked with them over to the rump rally that wound up at City Hall. It was kind of a nice end to the day. Over at City Hall, though, the mood got a little uglier. There were chants of "Nobama, Nobama," and cops came out to line the steps. But nobody tried to enter the building, and after 10 minutes or so of chanting, the crowd dispersed. There were dirty tea bags littering the sidewalks outside City Hall and in Civic Center Plaza, and I couldn't help thinking of the city workers who'd clean up the mess. (I saw people handing back signs and placards to event organizers at the end; clearly a lot of the partiers had help with their signage.) An African-American neighborhood regular, missing some teeth and clutching his black hoodie against a cold April wind, just shook his head as he watched the crowd walk away. "Eight years of Bush and y'all out here now?" UPDATE: Christina Plutarkos just wrote a letter correcting my poor transcription of her sign.